We all like to click pictures and shoot videos on our smartphones and cameras. These shots either serve as a permanent record of our memories which then can be saved for a lifetime and shared with our friends and family online via social networks. But what happens, in reality, is that most of us are inexperienced photographers who just know how to click pictures and shoot videos but not necessarily how to click good pictures and smooth videos. Features such as image and video stabilization help us a lot in this regard assisting us to make the shots as perfect and beautiful as it can get. In this article, I’m here to discuss the stabilization techniques employed in gadgets like smartphones and digital cameras. I will try to explain the details as simple as they can get and trust me, you won’t find this article overwhelming with geekiness and Cambridge English! In order to understand the basics of image stabilization, first we must know how a camera works in reality. When you point the camera to a subject in order to shoot a picture, the shutter opens and closes rapidly to capture the light from the subject. The light which falls on the sensor is then converted to digital signals which are fed into a DSP (Digital Signal Processor) for displaying the image on the screen. The important factors determining the quality of the images taken by a camera is the aperture and shutter speed. In layman terms, the aperture is measured in f-number which is usually designated as f/1.7, f/2.4, f/2.2 etc. The smaller the f-number, more the light entering the lens and results in much better photos even in the low light conditions. Shutter speed determines for how much time the shutter needs to remain open. These may range from a fraction of seconds to minutes. Higher the shutter speed, lesser the light will enter the lens and vice versa. The problem with lower shutter speeds is that the highly sensitive sensor will move slightly when capturing the image or video with bare hands and causes blur and jitter in the pictures and videos respectively. This is where the need for image stabilization comes into the picture (no pun intended). Image stabilization broadly refers to a number of techniques employed to reduce blurs and jitters in the photos and videos caused by the motion of the camera during the exposure period of the sensor to the subject. Shutter speed plays a significant role in the need for image stabilization. If the shutter speed is too low, the time taken for achieving a steady shot is reduced. If the shutter speed is very high, there is more time for you to take a steady shot but a slight shake during the exposure will be amplified, resulting in a blurry image or a jittery video output. Image stabilization brings in a fix for these problems by allowing you to have high shutter speeds without the shakes and jitters. Stabilization is a relatively new technology compared to the advent of digital camera technology. 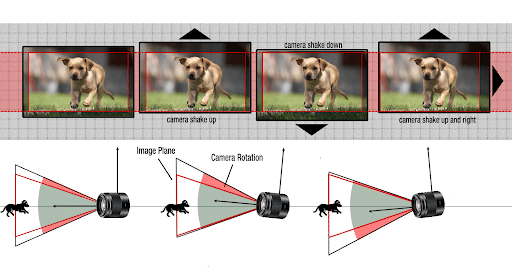 Optical image stabilization compensates for the shakes and camera movements by a physical contraption inside your smartphone or the digital camera. This physical contraption moves inside the camera housing compensate or negate your hand movements while taking shots. 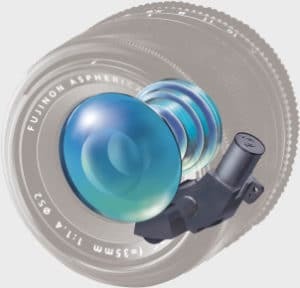 NOTE: Further categorizing the optical image stabilization, we have floating lens mechanism and the sensor shifting mechanism to stabilize the images, which will be discussed in the coming sections. Now that we have got the basics ready, let’s look into the details of an optical image stabilization hardware setup. Optical image stabilization hardware is made of many tiny bits and pieces arranged intricately to make the ultimate corrections possible within a small working space. Some of the main components of such a setup are listed below for a better understanding. As the name suggests, the part of the camera in motion here is the lens. The lens is given sufficient tolerance to move to and fro and up and down within the limited space for accurately capturing a stabilized frame. Floating lens setup is usually found on DSLR (Digital Single Lens Reflex) cameras. This is because such cameras come with interchangeable lenses and the size of the lens makes it possible to integrate OIS hardware inside them quite comfortably. The main advantage of a floating lens-based image stabilization is a smoother performance on lenses with large focal lengths. These lenses can also be fitted with any compatible cameras and the stabilization works universally. And the disadvantage is that the cost of the lens significantly increases if it has some form of stabilization built into it. The sensor shift mechanism is the most common implementation of OIS and found mostly in smartphones where lenses are static and built into the smartphone chassis. There are certain DSLR such as Panasonic GH5 which employs both sensor shift mechanism and the floating lens setup marketed with the term dual IS to increase the efficiency of the stabilization. In sensor-shift image stabilization, it’s the sensor that moves to keep the subject in frame and not the lens. The gyroscope is the single most important piece of hardware when it comes to the process of image stabilization. The gyroscope collects data about the orientation of your smartphone or digital camera and tracks even the slightest movement in your hand. Without a gyroscope, the device cannot execute correction measures for movements. The yaw, pitch and roll data from the gyroscope is then fed into the microcontroller which then gives the necessary information about how much the lens or the sensor should shift to compensate the movement, based on the intensity. Electronic image stabilization is purely done by means of software processing and doesn’t involve any physical mechanisms to counteract the shakes. While capturing a shot or a video, the microcontroller keeps a reference frame in memory for comparison with the successive shots following the first one. This comparison with the preceding frames one after the other helps the microcontroller for recording the variations between them and makes horizontal and vertical arrangements to make the shots look smooth. In the case of video stabilization, if the microcontroller finds that the variation data is towards a single direction, it predicts the succeeding frame path, generating a smooth video. Another form of EIS is the AIS (Artificial Intelligence Stabilization) which is marketed by Huawei in their smartphones. The only difference here is that the variation calculation in these phones is done on a separate NPU (Neural Processing Unit) chip that comes integrated with the phone for AI features. Image stabilization, be it optical or electronic help solve a lot of accidental mistakes we make during photography. For those who don’t have the budget to purchase an expensive gimbal, the in-camera or in-phone stabilization is a great value for money deal. Optical image stabilization comes standard on many high-end smartphones and most of the DSLR cameras but the Electronic image stabilization, which can be easily added to the feature kitty with software updates is yet to see a wider rollout. With the advancement of technology leading to the invention of exceptionally capable image sensors and optical systems, we are sure the image stabilization too will improve over time, giving more power to the normal users to develop a more professional approach towards mobile photography.